How Does The Price of Shrink Wrap Scaffold Sheeting Compare With the Price of Monarflex® Sheeting? A frequent question we are asked by scaffolders and contractors who are considering scaffold shrink wrapping is; How does the price of scaffold shrink wrap compare with the price of Monarflex sheeting? Firstly, my apologies, this is quite a long article, written for scaffolders and construction contractors who need detailed information about scaffold sheet pricing and the variables that can affect it. After reading, I hope you will be able to make an informed business decision about which scaffold sheeting to use which will hopefully lead to happy customers and more repeat work for your company. Before we dive in, we need to clarify; When we talk about ‘Monarflex’ are we referring to ‘proper’, branded Monarflex® sheeting? or do we just mean generic ‘traditional style scaffold sheeting’? (which can sometimes look similar in appearance to genuine Monarflex®) Although this distinction might seem unimportant, in my experience, many of us in the construction industry often refer to nearly all traditional style scaffold sheeting as Monarflex®, whether it is the real deal or not, and there can be big differences in performance (and significantly for this article – price) between the two products. To make a proper comparison between traditional style sheeting and shrink wrap sheeting for scaffolding we need to make sure we are comparing products of broadly similar performance. To avoid confusion, in this article, when we are refer to Monarflex, we mean genuine Monarflex®, manufactured by the Icopal Group, and when we are referring to all other types of non-Monarflex branded generic scaffold sheeting we will be calling it ‘traditional style scaffold sheeting’. 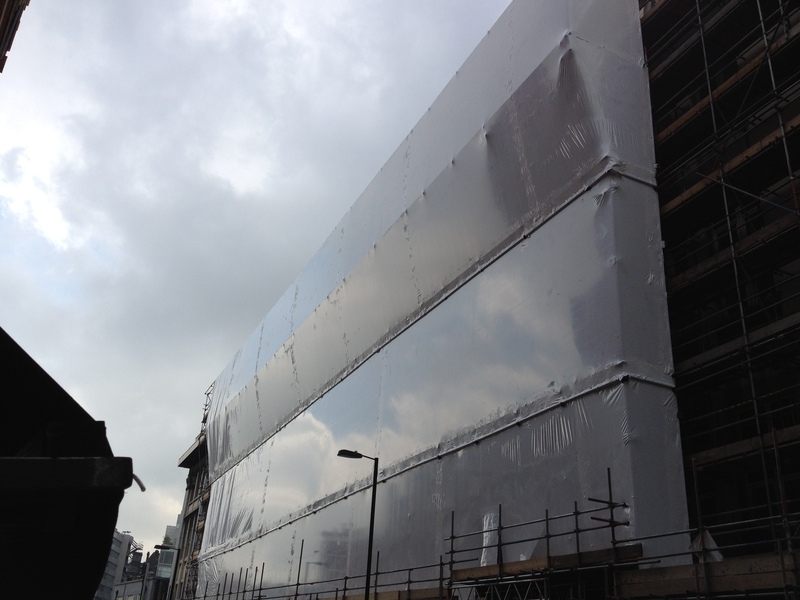 We refer to ‘shrink to fit’ scaffold sheeting, such as Rhino Verisafe® or Envirowrap, simply as ‘scaffold shrink wrap’. If you don’t have the time to read this article in full, the quick answer when comparing scaffold shrink wrap and traditional style scaffold sheeting pricing is that if the absolutely lowest price of the sheeting materials is the most important decision factor for you, your project is short term, and you don’t mind what the sheeting looks like or how well it is likely to ‘perform’ in terms of resistance to detachment, then you will certainly be able to find traditional style scaffold sheeting products available for less than the price of shrinkwrap sheeting for scaffolding. If however, the appearance of the scaffold sheeting is important to you and your customer, and your project requires high performance from the scaffold sheeting; perhaps detachment of the scaffold sheeting would have serious consequences or you require a high level of encapsulation & environmental containment, or you just want to make your projects stand out from the competition in terms of a smart and professional appearance, then you will probably be looking at choosing between Monarflex® or a shrink wrap sheeting such as Rhino Verisafe®. In that case the answer to the question ‘How does the price of scaffold shrink wrap compare to the price of Monarflex’ is not quite so clear will need exploring in more detail. It depends on whether you are comparing the price of a ‘high grade’ wind tunnel tested flame retardant scaffold sheeting such as Monarflex Super T Plus with high grade ‘Anchor & Tie’ fixings with scaffold shrinkwrap sheeting or whether you are comparing the price of a roll of non flame retardant Monarflex scaffband scaffold sheeting attached to the scaffolding with standard bungee ties. The right product selection depends on the wind loadings you need the sheeting to be able to withstand, how long you want the sheeting to remain up for, and of course what your customer is willing to pay for. As we shall see in this article, shrink wrap can look more expensive than Monarflex® and traditional style scaffold sheeting until you compare products on a ‘like for like’ basis – i.e. you need to compare a scaffold shrink wrap with a traditional scaffold sheeting product with similar performance characteristics. The answer to the price comparison question also depends on what you need the scaffold sheeting to do – is it for a temporary roof covering? temporary weather protection to a scaffolding facade? or to provide full environmental containment around a bridge for blasting and painting operations? Finally, and as we shall see, perhaps most importantly, the answer to the price comparison question between traditional style scaffold sheeting and scaffold shrink wrap depends on whether you are looking just at the cost of the scaffold sheeting and the labour to fit it, or whether you factor in the costs of maintaining and repairing the sheeting, and the costs of any delays caused by detached scaffold sheeting. Because of the size of this article,we have split it into two parts. The price of the scaffold sheeting materials. The price of labour to fit the scaffold sheeting. The price to remove the scaffold sheeting once the project is finished. The price of maintaining / repairing the scaffold sheeting over the lifetime of the project. The price of standing workers down from a construction site where sheeting has become detached. Fines and charges from environmental contamination. First up, lets take a look at ‘Monarflex’. We have chosen to compare scaffold shrinkwrap pricing with Monarflex due the dominance of Icopal’s ubiquitous product in the market. However, there are other brands / manufacturers in the UK including ‘Powerclad’ by ITP and Power Plastics plus sheeting that is imported into the UK from manufacturers worldwide. 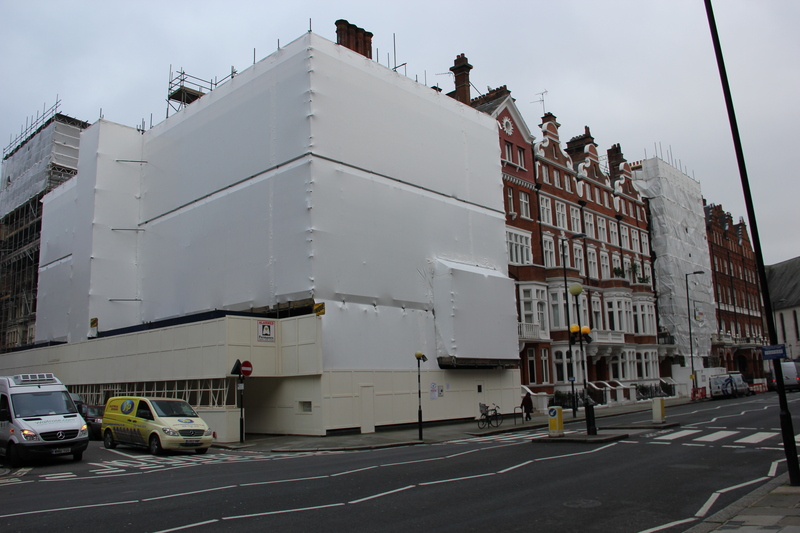 As specialists in shrink wrap sheeting for scaffolding you might expect us to be a bit biased but we think that for many scaffolders and for many projects, Monarflex® sheeting is a great product with which to create temporary weather protection or containment. Furthermore, it is widely available and every scaffolder knows roughly how to fit it. However, the first challenge when comparing the price of shrink wrap sheeting and Monarflex is which ‘grade’ of Monarflex do you choose to compare? A glance at the UK website for Monarflex reveals many different types of scaffold sheeting including IcoScaff, Scaffband, Stripe and Super T Plus available in regular and flame retardant versions. The second problem in determining the price is finding suppliers and distributors of Monarflex who are upfront about their pricing. It appears that in this ‘information age’, many suppliers of scaffold sheet are quite reluctant to give pricing information on their website! However, from conducting an online price search in June 2015 for scaffold sheeting we found Monarflex’s top of the range Super T sheeting supplied by Arco http://www.arco.co.uk/products/3203245 at £343.43 / roll. At the other end of the scale, Total Scaffolding Supplies http://totalscaffoldingsupplies.co.uk/scaffold-sheeting.html list a non flame retardant, 170 grams per square metre, 2 metre x 45 metre traditional style scaffold sheeting for just £35.00! This is another area where calculating the true costs of traditional scaffold sheeting can be confusing. Ties are supplied in different strengths and whilst minimum spacing for ties should be one tie every square metre, in practice, more ties are used than this. Arco list Monarflex’s flagship ‘Anchor & Tie’ fixings (wind tunnel tested up to ‘hurricane force’ wind speeds – 77mph) as £95.76 for a pack of 100 ties. In contrast, Total Scaffolding Supplies list their bungee type scaffold sheeting toggle ties for as little as £12.60 for a pack of 100 but there is no mention of what wind speeds these ties will perform up to. 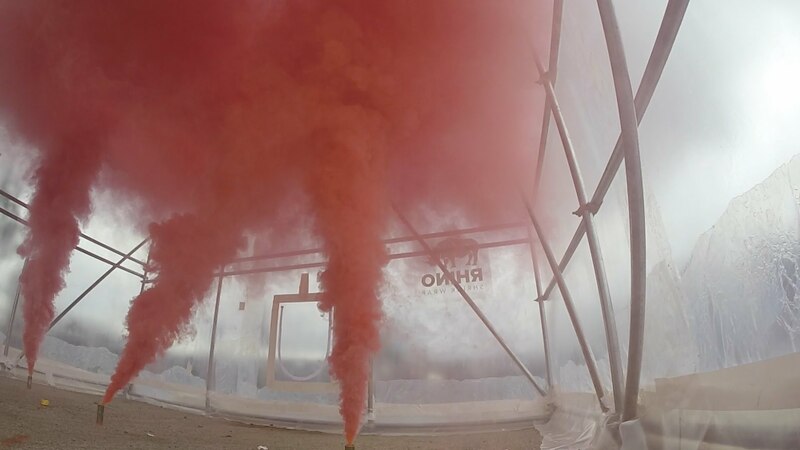 Don’t forget….Monarflex type sheeting is re-usable……isn’t it? Some scaffolders believe that Monarflex works out much cheaper than shrinkwrap for scaffolding because it is re-usable. 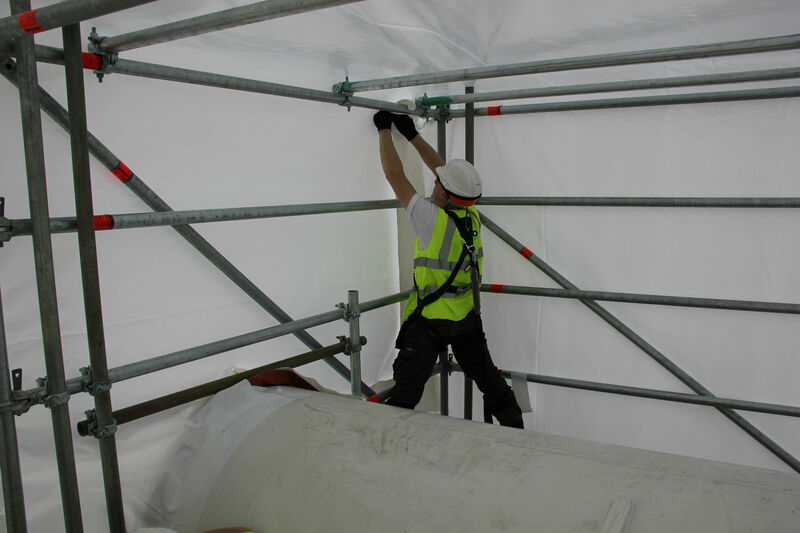 We agree, if the Monarflex type sheeting has only been installed for a relatively short period of time, and the bungee ties have not been stretched beyond use, then a scaffolder can send his team in to remove and fold the sheet for another job. In practice, we find this rarely happens, either because the sheeting and ties has become worn out or it simply costs more in labour to have scaffolders carefully remove and fold sheeting, bring back to the yard and store for re-use, than it does to dispose in a convenient on site skip and purchase new rolls for the next job. Now, lets take a look at the shrink wrap sheeting for scaffolding pricing. Although scaffold shrink wrap sheeting can be supplied in widths up to 12 metres, it is usually supplied as a 7 metre wide x 15 metre long roll (folded 4 times to allow for easier transport). The typical price from suppliers is £186/roll for quantities up to 30 rolls and £139/roll for quantities over 30 rolls. Why 30 rolls? Well, 30 rolls is equivalent to around 1000Kg or 1 x full pallet. Shrink wrap sheeting is generally supplied in white, 300 microns thickness and flame retardant to EN13501 as standard. Shrink wrap sheeting is not tied to the scaffold sheeting using bungee ties but it is secured to the scaffolding by wrapping around a scaffold tube and then heat welding the wrap back on to itself using a shrink wrapping heat tool. Rather than covering a scaffolding on a lift by lift basis, a sheet of shrink wrap will typically be dropped 3 lifts (around 6 metres). Once it has been secured to the scaffolding and any overlapping sheets have been heat welded together, the entire sheeting is heat shrunk ‘drum tight’, to create a completely sealed skin around the scaffolding. From our conversations with scaffolders and contractors, it seems that a typical / realistic price for a roll of ‘mid-range’, flame retardant Monarflex® brand scaffold sheet (such as Scaffband or Stripe) is £110 (including ties) for a 2m wide x 45m long roll (90 square metres) which is equivalent to £1.22 / m2. Meanwhile flame retardant shrink wrap scaffold sheeting may be priced at up to £186 for a 7m wide x 15m long roll (105 square metres) which is equivalent to £1.77 / m2. This is quite a price difference! So, why do scaffolders and contractors use scaffold shrink wrap for their projects? What other factors might you want to consider for an accurate price comparison? Read on to find out more. The cost of labour to fit Monarflex® or traditonal style scaffold sheeting can be calculated fairly accurately. Generally, a scaffolder can install up to 300 square metres per man per day. Based on a labour cost of £150 / day, the cost of installing traditional style scaffold sheeting is 50 pence per square metre. Although it will be easier to fit if the scaffolding is flush, as traditional style sheeting is hung on a ‘lift by lift’ basis, tubes will protrude through the sheeting at the points where the sheets overlap. It won’t be pretty and it won’t provide very effective containment of dust and debris but it does not affect the labour costs too much. However, with the installation of shrink wrap sheeting, the set up of the scaffolding structure can have a major affect on the rate of installation. If a scaffolding structure is flush, (or even better a system scaffolding), and consists of long straight runs, it can be quite possible to install over 200 square metres per man per day. If the scaffolding is not flush, the shrink wrap installer will have to cut the shrinkwrap around protruding scaffold tubes and re-seal the sheeting using the hot air gun. Depending on the level of weather protection or containment required, the installer may have to go back and tape around those protrusions to try and create the required seal. Similarly, if the shrink wrap sheeting is being used as a temporary roof covering, then this type of installation will take longer and the installation rate may drop to around 100 square metres per man per day. Poor weather may also impact negatively on the installation rate of scaffold shrink wrap compared with traditional style scaffold sheeting. Windy conditions can make it difficult to shrink the sheeting ‘drum tight’ and it can be difficult to make the most effective heat sealed joint between sheets in very wet conditions. Monarflex can be installed at rates up to 300 square metres per man per day, which works out around 50 pence per square metre assuming a labour rate of £150 / man / day. We normally estimate that an experienced shrink wrap contractor should be able to install up to 200 square metres of sheeting per man per day. Based on a labour cost of £150 / man per day this means that shrink wrap will cost more to fit than Monarflex, on average around 75 pence per square metre. Cost To Remove Scaffold Sheeting? This is never going to be a deciding factor in the Monarflex ‘v’ shrinkwrap pricing debate but for the sake of completeness it is interesting to compare the cost of removing traditional style scaffold sheeting versus the cost of removing shrinkwrap scaffold sheeting once the project is complete. To remove traditional style scaffold sheeting, the ‘bungees’ have to be untied from the scaffolding one by one. If the sheeting is to be re-used or recycled then the bungees will also have to removed from the sheeting one by one. Scaffold shrinkwrap sheeting is much faster to remove. By cutting parallel to the scaffold tube at each point where the scaffold shrink wrap has been welded around the scaffold tube along the weld. We normally estimate that one man should be able to remove, bale and load into a van about 300 square metres of shrink wrap sheeting per day. You can view a video of the shrinkwrap removal process here [Link to a video]. The speed of removal is even more noticeable where the shrink wrap sheeting is being used as a temporary roof cover. Instead of unclipping and removing individual tin sheets, the shrink wrap can be cut off in sections, and bundled for recycling. In part 1 of this article we have examined the upfront costs of creating temporary weather protection or environmental containment, namely; The cost of the scaffold sheeting materials, the cost of labour to fit the sheeting and the cost to remove the scaffold sheeting once the project is complete. Taking these basic costs into account, it seems that on first look, scaffold shrink wrap sheeting is in many cases going to be a higher price than Monarflex. This begs the question; so why is shrink wrap sheeting on so many jobs, particularly larger and more ‘demanding’ projects? 1) There is not a significant price difference between Monarflex and shrink wrap when they are compared on a ‘like for like’ basis in terms of resistance to detachment in high winds. 2) There are other ‘costs’ surrounding the sheeting of a scaffolding structure which are not always so obvious, but can be significant. Part 2 of this article explores these ‘hidden’ costs and misconceptions about scaffold sheeting in more detail. One of the chief ‘hidden costs’ of traditional style scaffold sheeting is the cost of maintenance and repairs over the life of the project. Now, I am not saying that shrinkwrap scaffold sheeting will withstand all wind speeds or that traditional style scaffold sheeting will blow off and detach at the first gust of wind but detached scaffold sheeting is obviously a problem for both scaffolders and contractors. For the scaffolder, damaged scaffold sheeting is a problem because they have to go back and fix it. Scaffolders have told us that they have been back to some projects 3-4 times to re-attach failed scaffold sheeting. This means pulling their teams from other jobs, and buying more sheeting to replace what has been damaged…..and they have an unhappy customer (the contractor). This is not reflected in the upfront price of the sheeting materials but it is reflected in the total cost of the job. If you are using ‘traditional’ scaffold sheeting, one way of reducing the possibility of scaffold sheeting blowing off is to use the highest grade products and tie system available. 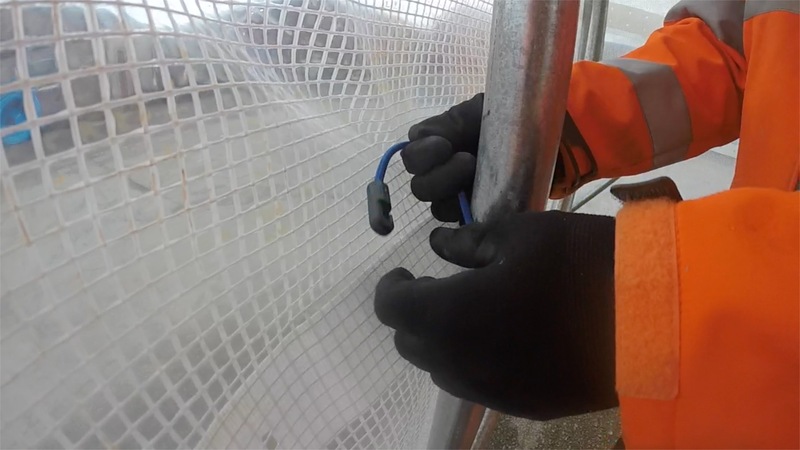 In the case of Monarflex, their ‘Super T Plus’ scaffold sheeting has been wind tunnel tested to 77mph when used in conjunction with their ‘Anchor & Tie’ system. However, as we have already seen, this product carries a significant price premium compared with other Monarflex products. 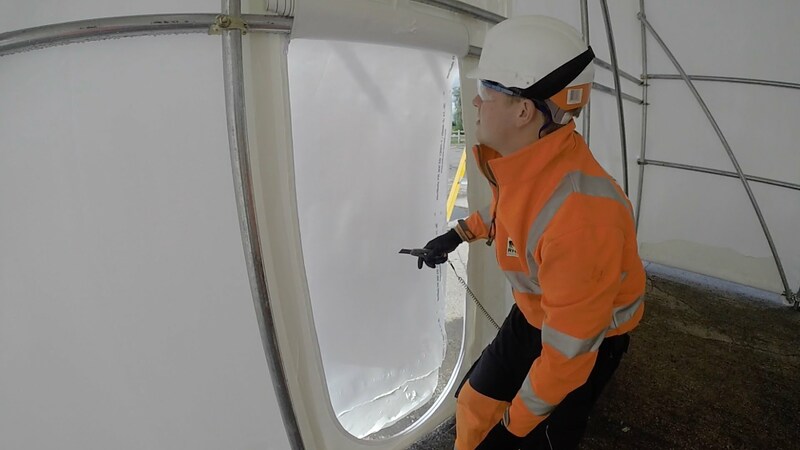 Rhino Verisafe® sheeting has been tested in some of the most extreme locations worldwide such as the Forth Road Bridge in Scotland where wind speeds regularly exceed 100mph. If you would like to take a ‘deep dive’ on the strength of scaffold shrink wrap then you can take a look at our article here but we can see from the quick comparison here that Monarflex sheeting looks cheaper than scaffold shrink wrap until we compare a traditional style scaffold sheet of equal strength with scaffold shrink wrap. Then, it is surprisingly close, Super T Plus works out at £343.43 for a 2m x 45m roll from Arco which is the equivalent to £3.81 per square metre without allowing for ties which from Arco are 9 pence each (as of time of writing). So traditional style scaffold sheeting looks to be a much lower price than scaffold shrink wrap sheeting but these lower price products such as Monarflex stripe or scaffband ranges are only recommended for use on shorter term projects that are not exposed to a high wind risk. If you compare a ‘like for like’ product, designed to withstand similarly high wind speeds, such as Monarflex Super T Plus then actually shrink wrap sheeting may be a lower price option. One of the handy aspects of scaffold shrink wrap sheeting is that should the worse happen, any local damage to the sheeting can be patched and sealed using an additional sheet. This is done by taking a patch of shrinkwrap sheeting and applying it over the damaged area, so that it overlaps the damaged area by at least 30cm. After temporarily holding the patch into position with 1-2 pieces of tape, the installer then uses the shrink wrapping heat gun to heat weld the patch to the original sheeting. Done properly, this patch and joint should be as strong as the original sheeting. If workers are stood down because of bad weather, or because the scaffold sheeting has become damaged and the working area is not safe then this can be costly and bad for the reputation of the companies involved (and the sanity of the site managers and project managers involved). In addition, main contractors typically face fines if a project over runs and so a rugged and reliable sheeting can act as a kind of ‘insurance’ against this event. One type of project where shrinkwrap scaffold sheeting is often found is to provide ‘full encapsulation’ around the blasting and painting of bridges. With this type of job, the scaffold sheeting is required to provide complete environmental containment of blast media and the paint residues which often contain lead and other toxic materials. Once contained, the toxic materials are removed and disposed of. The shrink wrap scaffold sheeting also allows for a controlled environment during the painting and curing stage. Shrink wrap sheeting is used for these projects for three reasons; 1) A film size of up to 12 metres allows for a covering with far fewer joints between sheets than traditional scaffold sheeting which tends to be only 2 metres wide. 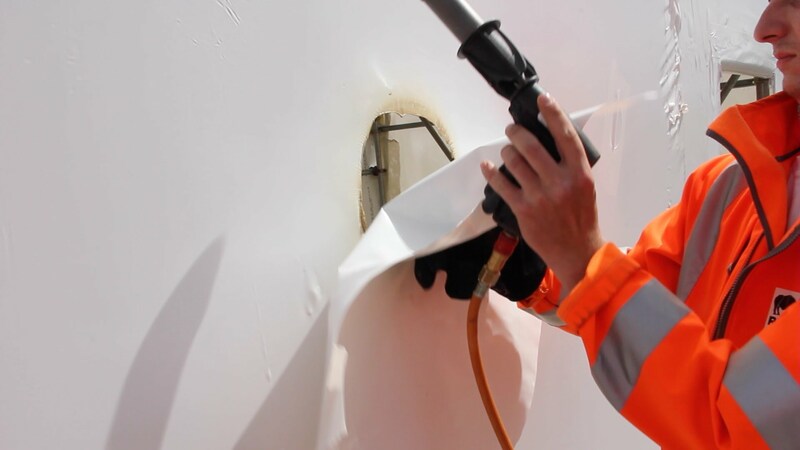 Where sheets of shrink wrap sheeting need to be joined, they are overlapped by approximately 30cm and heat welded together using a small hand held propane gas powered shrink wrapping gun. It is much easier to create a ‘final seal’ around a scaffolding with shrink wrap sheeting. Bridges are often in exposed locations, and subject to high wind loadings. Failure of the scaffold sheeting could mean a release of toxic material into the environment (bridges are normally over a water course of some kind). Whilst traditional scaffold sheeting can be used for environmental containment, sheets are typically just overlapped, and not sealed. Adhesive tapes can be used to seal joints but this is not ideal as it is time consuming and the adhesive strength of tapes can be be very variable according to temperature, humidity and the cleanliness of the sheet. For the larger construction projects, or industrial projects shrink wrap is used for these very reasons. Although the initial costs may be slightly higher for shrink wrapping, the ongoing maintenance will be less and the risk of delays or over runs is minimised. It is not that scaffold shrinkwrap is ‘good’ or traditional style scaffold sheeting is ‘bad’ but that we need to take more factors into account when calculating the true cost of each product than the basic material price of each product. Both traditional style scaffold sheeting such as Monarflex® and shrink wrap sheeting have advantages and disadvantages, it depends on what you need them to achieve. For a contractor who needs fairly short term, basic level of weather protection then traditional style scaffold sheeting is a low cost, ‘cheap and cheerful’ solution. Traditional style scaffold sheeting can be bought for as little as £35 / roll which works out at just 38 pence per square metre! However, there is no way that this product is going to provide long term or storm proof temporary weather protection or effective environmental containment. To get a traditional scaffold sheeting product that has the same level of performance as shrink wrap sheeting then it is highly likely that it is going to cost the same or more than shrink wrap sheeting. However, although it is quite understandable that scaffolders and contractors looking at shrink wrapping for the first time might want to do it, it is actually bit pointless and quite quite difficult to compare pricing between two very different products. Shrink wrap scaffold sheeting is not designed or developed to be the cheapest product on the market; every project that utilises shrink wrap does so for the extra performance and different benefits it provides, compared to traditional style scaffold sheeting. And that really is the point of this article, if you need the extra benefits of strength, or improved final seal, then the you are likely to have a project where the costs of failure or something going wrong exceeds the slight extra cost of purchasing and installing shrinkwrap sheeting for scaffolding. Scaffold shrink wrap products, such as Rhino Verisafe® are not a good ‘fit’ for every project but for should be considered for those where the costs of failure are more important than the price of the sheeting.